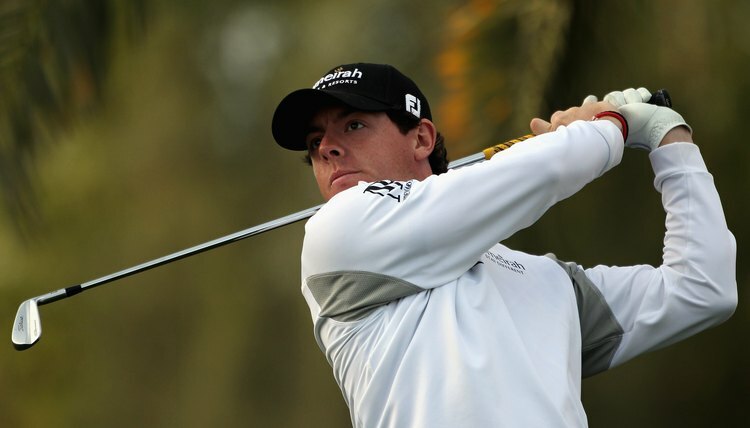 Rory McIlroy uses a blade iron during the 2012 Dubai Desert Classic. Bladed golf clubs are irons, which have a long history. When hard rubber golf balls, known as Gutta-percha balls, were introduced in the mid-19th century, irons with metal clubfaces -- usually forged by blacksmiths -- came into use. They were known as forged irons, or as blades, because the sleek slabs of metal resembled a knife blade. Blades have a very small sweet spot, so a golfer must be sufficiently skilled to use them effectively. If you miss the sweet spot, you can expect shots that slice or hook and travel shorter distances. Golf balls initially were constructed from leather orbs stuffed with feathers and golf clubs were made from wood, since a metal club would damage the ball. But the advent of harder rubber golf balls induced some club makers to create forged iron clubs, which became the instruments of choice early in the 20th century. Unlike wood, iron clubs can be constructed with sharper angles to give shots a higher trajectory. Blades remained the standard until the 1980s, when cavity-back irons, with a hollow space at the back of the clubhead gained popularity. The cavity-back enabled engineers to move weight around the clubface to enlarge the sweet spot so average could produce longer and straighter shots on off-center hits. The more forgiving cavity-back irons introduced in the 1980s are known as game-improvement clubs or super-game improvement -- the latter offer the most forgiveness on mishit shots. Blades became known as player's irons, designed for elite golfers. However, pure old-fashioned blades are on the decline, since player's clubs are now designed with some of the forgiveness of cavity-backs. While some PGA Tour pros cling to tradition, many use irons that combine the old-fashioned blade with some of the forgiveness of cavity-backs. Part of the allure of blades is their sleek appearance, and blades give top golfers the ability to shape shots. Blades make it easier to work the ball to the left or the right, whereas cavity-backs tend to reduce sidespin and make it harder to deliberately hit draws and fades. Blades also give the golfer feedback. If you hit a shot right on the sweet spot, it feels pure and effortless and produces maximum distance and accuracy. Ordinary golfers should steer clear of blades and player's clubs and opt for game-improvement or super-game improvement irons. For a golfer who's approaching excellence, however, using an old fashioned set of blades on the driving range can be a great teaching tool. It will make it easier to pinpoint flaws in your swing since you can more easily identify where the ball contacts the club. Plus, a set of blades in your bag looks really cool.